If you’ve been invited to your first Indian wedding, you’re probably curious about what’s going to happen. We enlisted the help of Indian wedding planner Suniti Patel, of Lamhe Bridal Consultants in New Jersey, to get answers to some commonly asked questions about Indian weddings. A: Brighter is better. Don’t be afraid to wear a bold color; that will help you fit in with the Indian guests who’ll be dressed in vibrant colors and eye-catching jewelry. If you don’t have a traditional sari or lehenga, don’t worry. A jewel-tone dress with a shawl can mimic the festive look. A: A traditional Indian wedding lasts an average of three days. On the first night, a priest will often perform the Ganesh Puja, a ceremony that usually happens at home with only the couple, the bridal party, and close relatives in attendance. The second day begins with a mehendi ceremony. For this, the bride and her female friends and family members will have intricate henna patterns drawn on their hands and feet. That evening, the sangeet takes place. Every wedding guest is usually invited, and it involves an introduction of the couple’s families, mingling, a meal, and dances or other performances. On the third day, the main ceremony, cocktail hour, and reception take place. You may be invited to the last day of the events, or to any part of the three-day celebration. Your invitation should clearly state what you’re being asked to attend. 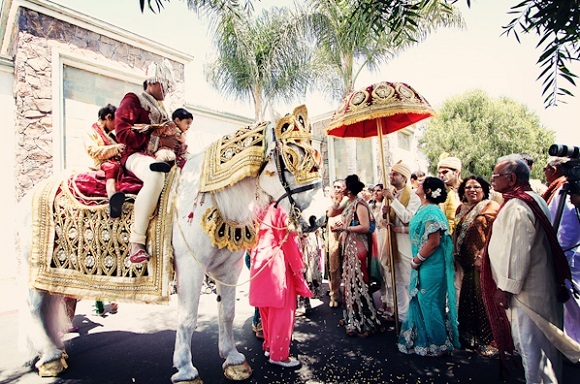 A: One of the first things that might surprise Western guests is the baraat, or groom’s procession. For this, the groom arrives to the ceremony on a decorated white horse. Guests dance around him to the beat of the dhol, an Indian drum. After that, the bride and her family greet the groom, and the couple exchanges floral garlands to wear around their necks to symbolize their acceptance of each other.For the ceremony, the priest, groom, bride, and bride’s parents sit beneath a mandap, a canopy similar to a Jewish huppah. The ceremony starts off with the kanya daan, in which the bride’s parents give away the bride. Then the couple joins hands and circle around a small, enclosed fire (agni) in a ritual called the mangal phera. Then the couple will take the saptapadi, or seven steps, as they vow to support each other and live happily together. Finally, the groom will apply a red powder to the center of the bride’s forehead and tie a black beaded necklace around her neck, symbolizing that she’s now a married woman. A: It’s a crazy party. If you don’t know bhangra, a frenzied Punjab folk dance, expect to pick up the moves fairly easily. But don’t worry if you’re not comfortable learning new dances; you’ll most likely hear contemporary Western music at the reception too. A: Two of the most common misconceptions about Indian food are that it’s all spicy and it’s all vegetarian. In reality, it depends on which state the couple’s families are from. When served in the US, though, the food tends to be North Indian, meaning you’ll see a spread of naan (a flatbread) with different curries, samosas (savory pastries with spiced meats or vegetables), pakoras (fritters), and a dessert display, which typically includes cake, kulfi (Indian ice cream), and decorated sweets made from nuts. 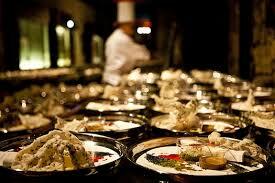 There will often be up to four stations of chefs preparing food for guests. Approach the fare with an open mind — you may like it more than you expect. A: Couples usually request that there be no boxed gifts at the wedding, so guests usually have gifts shipped to the couple’s home or bring an envelope full of money.